Thje Virgin Mary, seated in the centre of the panel is shown with her hands raised in an attitude of prayer. The figures of God the Father and God the Son are shown on either side raised on ledges, crowning the Virgin Mary. The Holy Ghost, represented in the form of a Dove, appears above the Virgin's crown in the centre of the composition. The Virgin, wearing an ornate triple crown, a close-fitting gown and a cloak, is seated in the centre of the panel, her hands presumably raised apart in an attitude of prayer. Above to the left, enthroned on a ledge and turned towards her, is God the Son, wearing a cloak draped over his knees, leaving the upper part of his body bare. His left hand touches the Virgin's crown; his right is raised. God the Father, crowned and bearded and wearing a gown and cloak, is seated in a similar position on the right of the panel, holding an orb on his lap with his left hand. He touches the Virgin's crown with his right hand. Both figures are shown with bare feet. A Dove, representing the Holy Spirit, descends from the top of the panel, holding the finial of the Virgin's crown in its beak. The style of the panel is distinctive. The figures on the panel are slender and delicate. The garments of the figures have been carved in deep flowing lines and the folds of the lower part of the Virgin's gown have been treated almost as a geometric pattern. The top corners of the panel, including the head of God the Son, are missing. 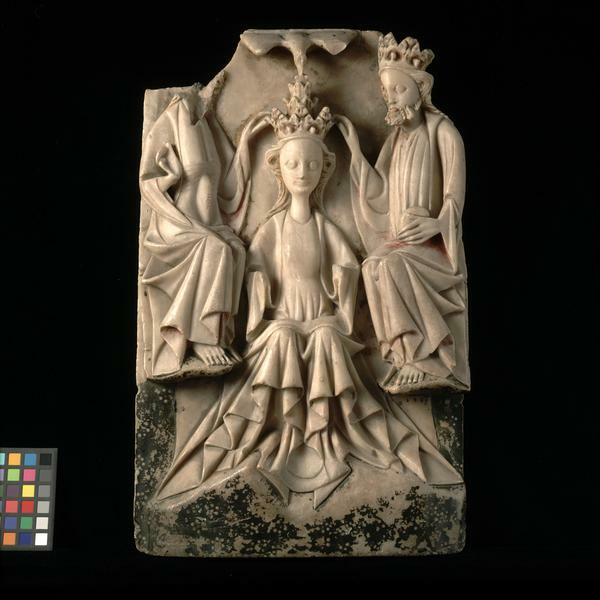 The Virgin's hands and the Son's right hand are missing. Green paint and usual daisy pattern remain on the ground at the bottom of the panel. There are traces of gilding on the upper part of the background, also traces of red on the robes of the Son and the Father. The back of the panel is marked with scratches that are probably random, although one is more prominent. There are three lead-plugged holes in the back. The bottom has been cut away. Acquired by Dr W. L. Hildburgh in Paris. On loan from him since 1930. Given by Dr Hildburgh in 1946. 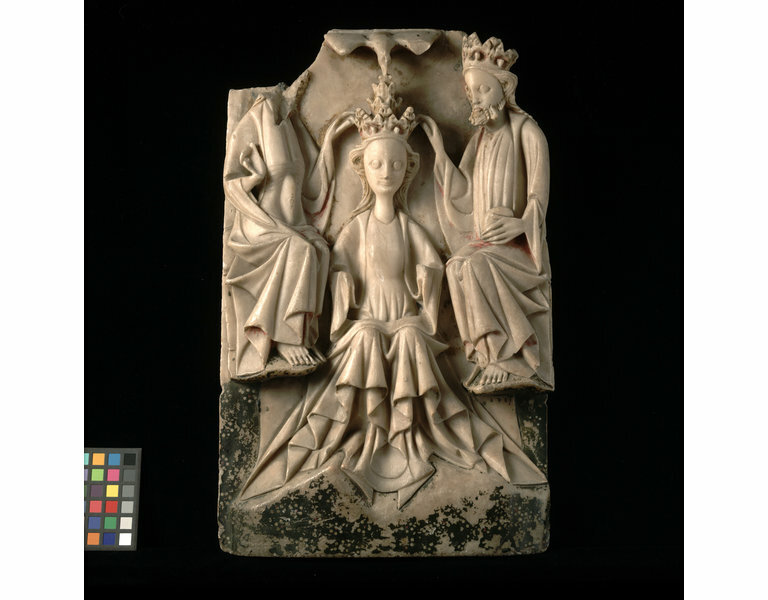 Alabaster panel depicting the Coronation of the Virgin. English, 15th century.